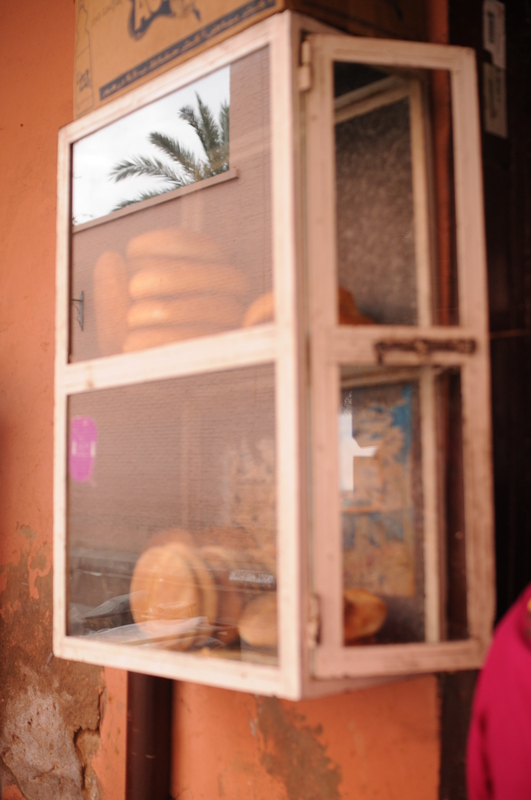 I had plans of coming back from Marrakech and writing hundreds of words about it but to be honest, i think the pictures just say it so much better than i ever could so, on the whole, i’ll let them speak for themselves- with maybe just a little help from me. The smell of smoke whilst we sat and ate here was overwhelming. Everything was so fresh and after a slight miscommunication we ende up with a selection of all these different skewers which we cooked over coals right next to us. The greenery around the front is called epinard which translates to spinach, although is unlike any i’ve ever seen. Its cooked and chopped and made into some kind of dip with oil and lemon and spices and is utterly delicious. I wish i’d been able to get a more concrete recipe as it’s something i could eat daily. When eating at the stalls in the main square you’re often presented with a plate of this and a plate of a pulpy tomato salad thing, that and some bread and you’ve got yourself a cracking little lunch. 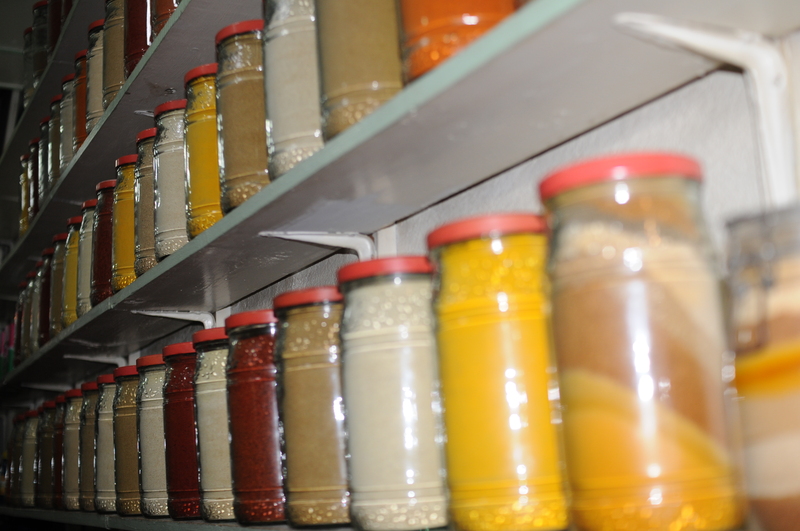 One of the spice shops. I may have gotten a little carried away and almost definitely got ripped off but it was such a great shop. I wish we had more like this here. 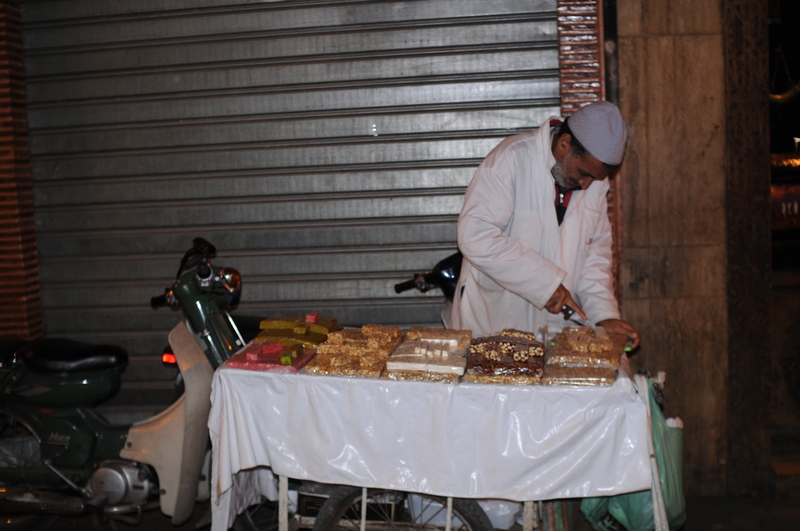 A lovely man selling Tangias. 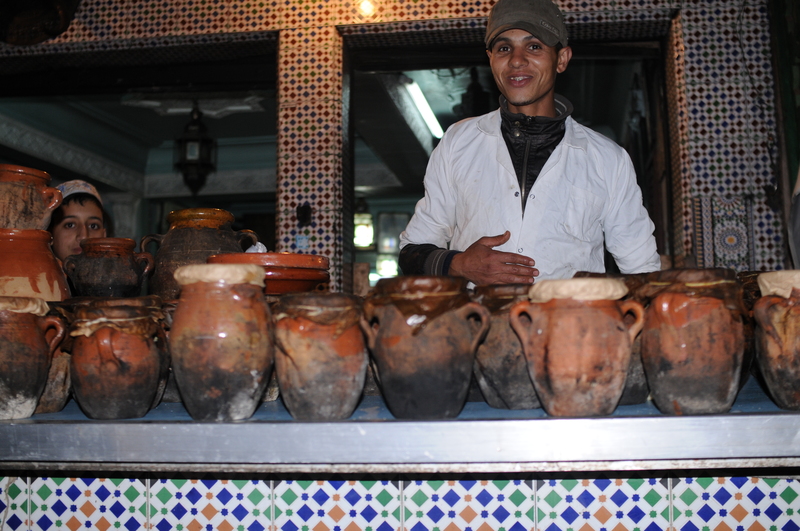 They’re clay pots filled with stew that are often cooked in the embers of the big communal bread ovens. Many people still don’t have their own ovens and so will fill up their tangias and drop them off at the oven in the morning, collecting them in the evening in time for dinner. Failing that, you can buy them from vendors like this. As someone who loves olives, it was incredibly difficult to walk past shops such as this one and not stop and buy everything in sight. The sheer abundance is what really draws you in but, for once, self control won out. Some pastries. 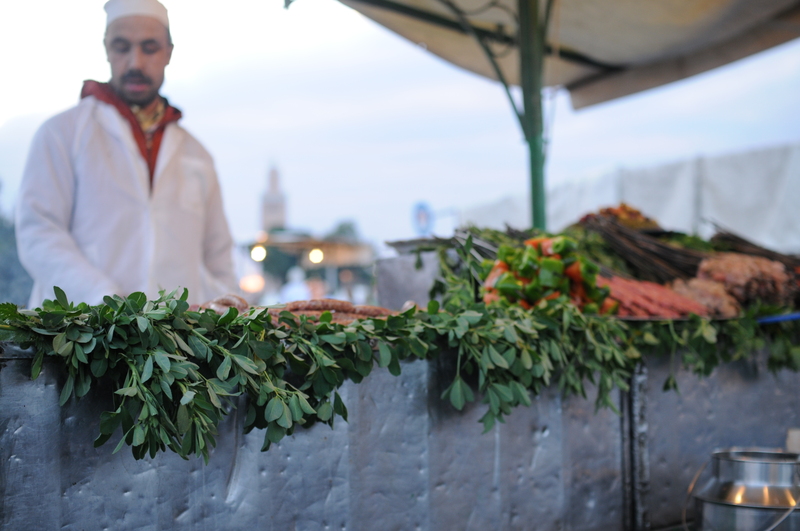 There were little tables dotted around everywhere as well as men with carts full of sweet things wandering through the market. They would stop outside the food stalls where you’d stopped to eat so you could have dessert without having to leave the little stall you were already at, such a great idea. The french influence is very apparent as there’s bread everywhere, even in little cupboards on the side of the road. 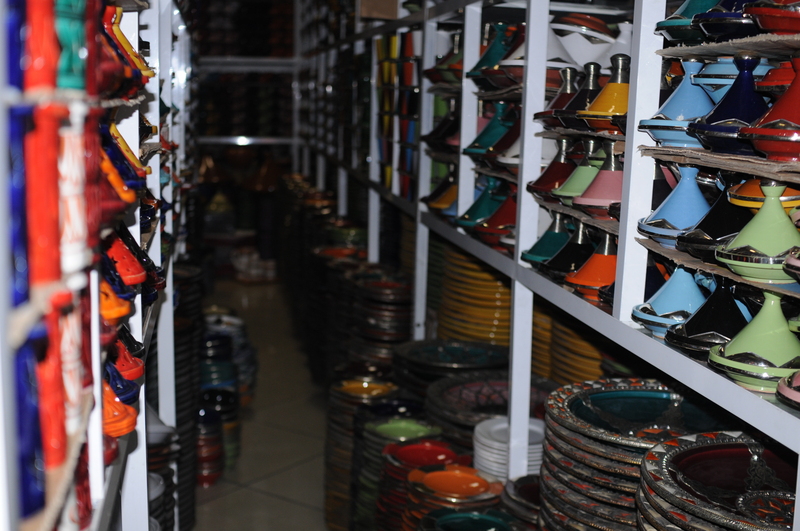 The most amazing wholesaler we found, all things bowl and plate. 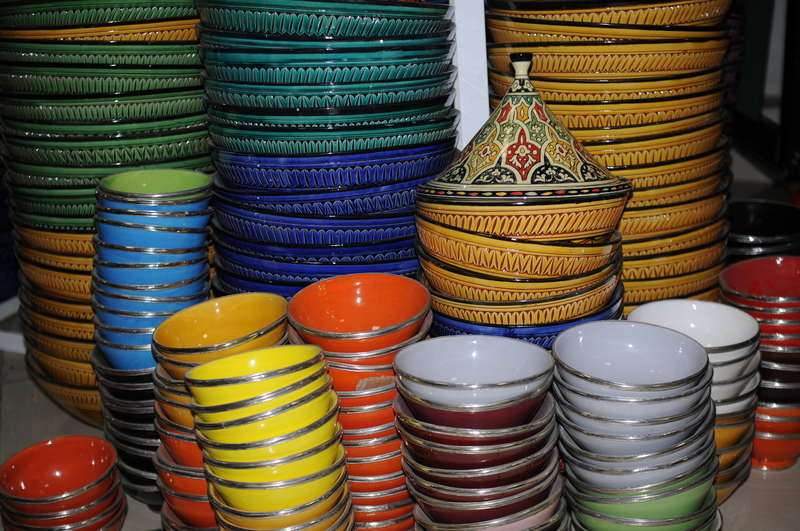 Tagines and plates and bowls, to be honest i’m quite impressed i didn’t come home with more than i did. 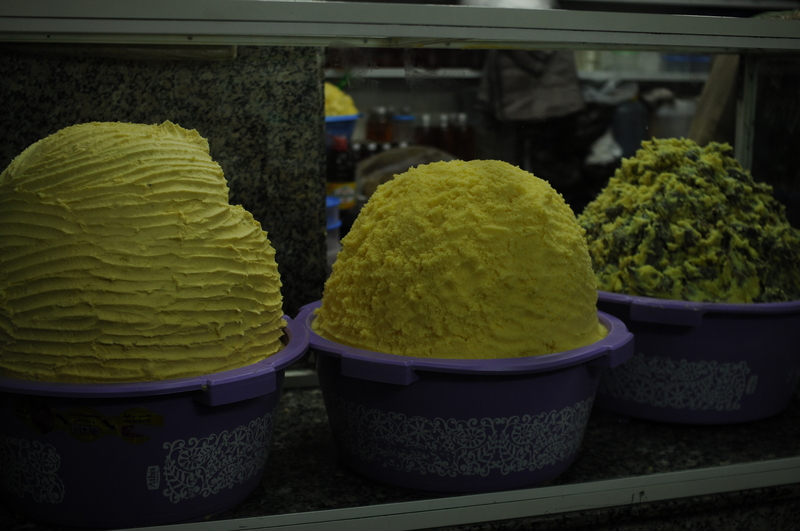 On first glance i thought these were bowls of butter but they’re actually huge bowls of cous cous. Whilst I was there I also had the great opportunity to go into the kitchen of our riad and watch Hind, our lovely cook as she cooked dinner on two of the days. As a result of this I’ve returned with some great recipies which will, no fear, be appearing on here soon. All i need to do first is get a better idea of the actual amounts of spices as it’s all by eye at the moment. As soon as that’s sorted, up they shall go. 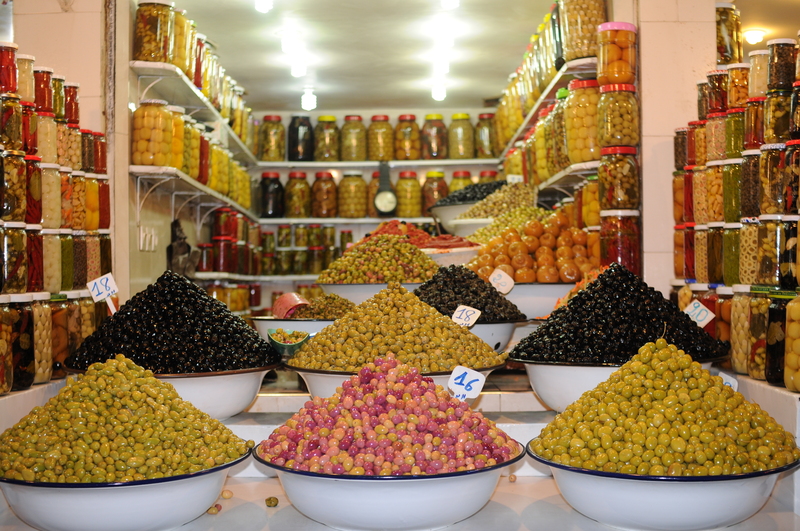 Uhh, this is your best blog yet…..perhaps a food travel writer is yoru calling.